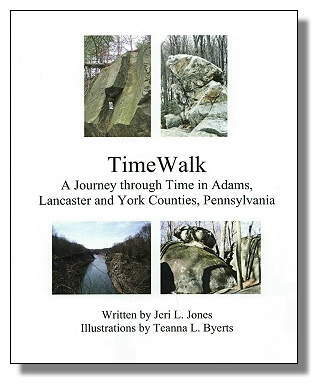 If you ever walked through the woods or around the neighborhood, picked up an interesting looking rock and wondered how it got there, you may want to purchase a copy of a newly released book "TimeWalk - A Journey through Time in Adams, Lancaster and York Counties, Pennsylvania." Written for the novice, the reader will learn much about our landscape and the numerous events that took place here over the past one billion years. Rocks in the three-county area represent two continental collisions and breakups; an ocean and beach environment; a chain of volcanic islands off of the coast of ancient North America and severe erosion and weathering including the Ice Age. The reader will learn of the many fossils found in the area including dinosaur foot prints, trilobites, petrified wood and shells. Because the area also contains valuable mineral resources, a section is presented describing key quarries, mines and mineral specimens. What makes TimeWalk interesting, however, is the listing of "Where Can I See These Rocks" sites at the end of each chapter. Author Jeri Jones states, "Although reading the story of our ancient history is interesting, it is a more-rewarding experience to go out and touch these rocks. Any rock you pick up will have a story to tell you about its early life." Chester County is the home of many famous and world-class mineral localities -- the Wheatley Mine, French Creek Mine, Brinton's Quarry, Poorhouse Quarry, Unionville corundum mines, Cornog Quarry, Beryl Hill, and the Parksburg rutile area -- to name just a few. This new book pulls together over 200 years of mining and mineral history under one cover. It is richly illustrated with 574 figures -- old and new photographs, old maps, mine cross sections, crystal drawings, and mineral photographs. Many of the old photographs have never been published before. It features a 16-page full color section with 74 photographs of Chester County's finest mineral specimens. The Mines and Minerals of Chester County, Pennsylvania describes over 400 mines and mineral localities. It includes the known history of each mine and locality and a list of reported minerals. The locations are shown on a set of USGS topographic maps. Because many of the mines had several names over the course of their history, a comprehensive cross-index is provided. Also included is an index of all minerals reported from Chester County with their localities. Large!!! 8-1/2 X 11 size with 512 pages! Include an email address for shipment tracking information.